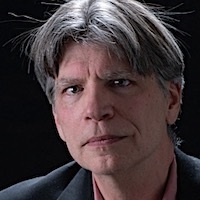 Richard Powers is the author of 12 novels. These works employ multiple narrative frames to explore connections among disciplines as disparate as photography, artificial intelligence, musical composition, genomics, game theory, virtual reality, race, business, and ecology. He has said, "Science is not about control. It is about cultivating a perpetual condition of wonder in the face of something that forever grows one step richer and subtler than our latest theory about it. It is about reverence, not mastery." His novels include Three Farmers on Their Way to a Dance (1985), inspired by German photographer August Sander's 1914 image of the same title; The Gold Bug Variations (1991), a double love story of two young couples separated by a distance of 25 years; and The Echo Maker (2007), whose main character, Mark, suffers a traumatic brain injury in a car accident and becomes convinced that the woman who looks, acts, and sounds just like his sister Karin is actually an imposter. His most recent book, The Overstory (2018), is a tale of activism and resistance, about the secret language of trees and the people they bring together to save the last few remaining acres of virgin forest. In the New York Times Book Review, author Barbara Kingsolver called it "monumental... The Overstory accomplishes what few living writers from either camp, art or science, could attempt. Using the tools of the story, he pulls readers heart-first into a perspective so much longer-lived and more subtly developed than the human purview that we gain glimpses of a vast, primordial sensibility, while watching our own kind get whittled down to size... A gigantic fable of genuine truths." His fiction and speculative essays have appeared in the New Yorker, Harper's, Esquire, Grand Street, the New York Times, Conjunctions, Granta, the Guardian, Common Knowledge, Wired, Tin House, Zoetrope, Paris Review, the Believer, Best American Short Stories, and the New York Times Sunday Magazine. His work has been translated into 16 languages. In 2010 he was inducted into the American Academy of Arts and Letters. Powers's books have won numerous honors, including the Rosenthal and Vursell Awards, the James Fenimore Cooper Prize from the Society of American Historians, the Corrington Award, a PEN/Hemingway Special Citation, the John Dos Passos Prize for Literature, and two Pushcart Prizes. The Gold Bug Variations was named Time magazine's Book of the Year. Powers is a MacArthur Fellow, a fellow of the American Academy of Arts and Sciences, and a recipient of a Lannan Literary Award. He won the W. H. Smith Literary Award (UK) for best novel of 2003 and the Ambassador Book Award from the English-Speaking Union in 2004. The Echo Maker won the 2006 National Book Award. In 2014 Powers was among the first Americans long-listed for the Man Booker Prize.